The superhero world isn't an easy place to make a a name for yourself. With the current love for superhero movies, it seems that everyone wants in on the action. But even those characters that have loyal fan bases seem hard pressed to deliver a good movie. So what of superheroes written specifically for the big screen? There haven't been many, especially with small budgets, but the few kicking around that are worth a mention (Boy Wonder (review), Super (review), Defendor (review)) all share a commonality: they're all based on regular guys who think they are or play at being superheroes. Enter Jordan Galland, the writer/director best known for Rosencrantz and Guildenstern Are Undead. With Alter Egos he enters the big screen/small budget superhero world with a comedy which is set in a very normal looking world where superheroes have been outed. And they're not just guys playing at superheroes, we're talking individuals who have powers. There's a lot of them and they've formed the Super Corps, an organization ran by Captain Amazingness, who collects government funding in return for fighting off super villains. Except there are no super villains left and Super Corps is falling on hard times. In an effort to win back their funding, Captain Amazingness develops a plan: bring back a super villain. Enter Fridge, a guy in a blue and white suit who freezes stuff. He's called in to help C-Thru, the name is explanatory, with an assignment. What Fridge doesn't know is that he's the linchpin in a plan to bring back super villains so that Super Corps can regain its funding and return to the old days when the organization actually meant something. All well and good except for the added fact that Fridge is going through a personal crisis which is distracting him from the task at hand. Galland deserves some credit for his aspirations and the basic premise which opens the door to a number of interesting possibilities but none of them are fully pursued. Fridge's personal issues are dragged on for far too long and when we finally get a showdown with the mind controlling villain Shrink, things get a little interesting but watching Kris Lemche acting, or trying to, opposite John Ventimiglia... it's laughable and it brings down the movie which barely had a pulse to begin with. 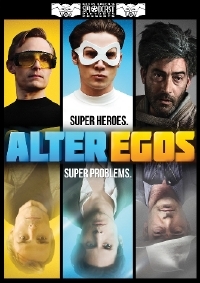 Alter Egos tries to play the comedy card and occasionally knocks out a line or two worthy of a smirk but overall, it fails to deliver any real laughs, even though they play some of the super hero conventions to their extremes. Quite honestly, watching the crew of "The Big Bang Theory" arguing about Superman's sperm is funnier than the entirety of Alter Egos. It certainly tries but in the end, Alter Egos just doesn't make the cut. If you're looking for low budget laughs, you're better off skipping this one and indulging in the fantastic The History of Future Folk (review). It doesn't have super heroes but it has aliens in hilarious costumes saving the earth from destruction, not to mention lots of laughs.